The cranial nerves are an endlessly fascinating family of twelve nerves that have a dramatic impact on our daily lives. A dysfunction of the cranial nerves can cause loss of vision or double vision, loss of smell, poor balance, or loss of muscle function, and can also be an indicator of underlying neurological disorders. 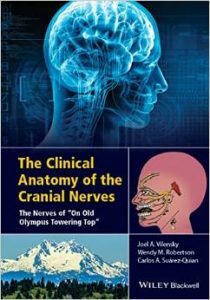 The Clinical Anatomy of the Cranial Nerves: The Nerves of “On Old Olympus Towering Top” is an engaging and accessible book on the anatomy and clinical importance of these unique nerves. The text opens with a brief introduction of key neuroanatomical concepts that relate the clinical and anatomical sections that follow. Additionally, this book uniquely provides a detailed description of the bones of the head and face in order for the reader to understand the routes taken by the cranial nerves through the skull. Chapters then detail each nerve and its unique impact in relationship to our senses, motor function, and health. Vividly illustrated and supported by real-life clinical cases, the book will appeal to anyone wishing to gain a better understanding of the cranial nerves. Merging anatomical and clinical information with intriguing clinical cases, The Clinical Anatomy of the Cranial Nerves: The Nerves of “On Old Olympus Towering Top” introduces readers to the anatomy and diverse function of this intriguing family of nerves.